This is a very fine and high quality circa 1972 LONGINES ADMIRAL in Stainless steel having the revered caliber 6651 25 jewel movement in a 35.5mm. 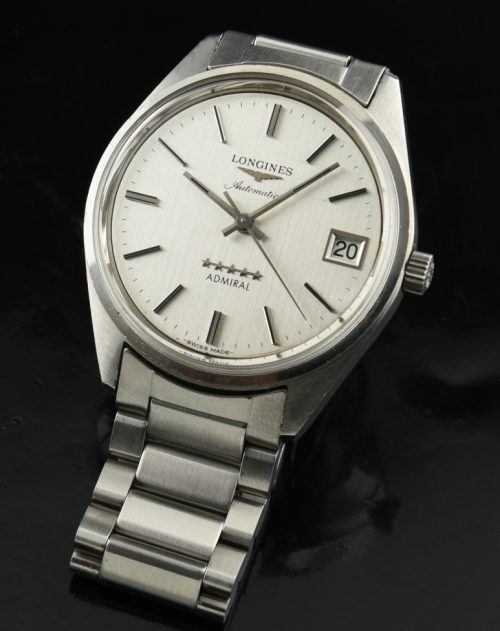 stainless steel case with original LONGINES crown and original gray satin dial. The LONGINES bracelet (by Champion) is also original, fitting up to a 6.5 inch wrist. The entire ORIGINAL watch, dial and bracelet display excellent overall condition and are without any major flaws whatsoever. The date can be quickly advanced by going bank and forth between 9 P.M. and 12. This LONGINES is understated and offers superior value for the money. If you are seeking a clean-lined watch that will provide a lifetime of reliable service-you found it!